During the Cold War an unlikely coalition of poets, editors, and politicians converged in an attempt to discredit — if not destroy — the American modernist avant-garde. Ideologically diverse yet willing to bespeak their hatred of modern poetry through the rhetoric of anticommunism, these “anticommunist antimodernists,” as Alan Filreis dubs them, joined associations such as the League for Sanity in Poetry to decry the modernist “conspiracy” against form and language. In Counter-revolution of the Word Filreis narrates the story of this movement and assesses its effect on American poetry and poetics. 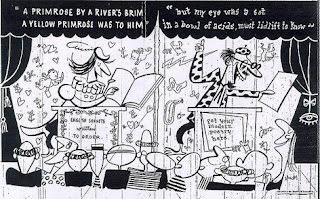 Although the anticommunist antimodernists expressed their disapproval through ideological language, their hatred of experimental poetry was finally not political but aesthetic, Filreis argues. By analyzing correspondence, decoding pseudonyms, drawing new connections through the archives, and conducting interviews, Filreis shows that an informal network of antimodernists was effective in suppressing or distorting the postwar careers of many poets whose work had appeared regularly in the 1930s. Insofar as modernism had consorted with radicalism in the Red Decade, antimodernists in the 1950s worked to sever those connections, fantasized a formal and unpolitical pre-Depression High Modern moment, and assiduously sought to deradicalize the remnant avant-garde. Filreis’s analysis provides new insight into why experimental poetry has aroused such fear and alarm among American conservatives. The illustration above will appear in the book. It was drawn by Howard Sparber for a conservative antimodernist diatribe written by Stanton Coblentz and published in the New York Times Magazine in 1946.